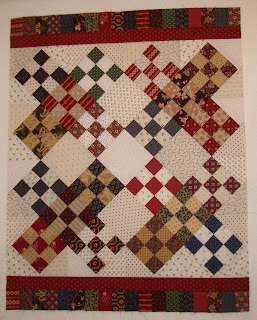 Squash House Quilts: 9-Patch Challenge Finish! Now I know why everyone is crazy about Schnibbles patterns from Carrie Nelson! They are well written, easy and fast to finish! As you know, I am participating in Anne Marie's 9-Patch Challenge. Maybe I'm the first finish? I'll find out from Anne Marie soon, I'm sure! I now have 5 tops ready to quilt for whenever Lenni arrives! As I said in a previous post, this was a kit that was given to me last fall, so I'm following the rules for using only what is in my stash! I am also participating in Ulla's Use Your Stash 2011, so I think I've accomplished two challenges in one! The fabrics in this kit were Civil War fabrics - the lights are all shirtings. I wish the colors showed up better, but this is the best I could do with photo editing! My studio gets very dark and shadowy in the afternoons. When the electrician was here the other day, I asked him to give us an estimate on different lighting for the room. I'm thinking I might like recessed lighting around the room. I also have two Ott Lites which I shine directly on my work surface. I would be interested in any comments about lighting from those of you who have designed your quilting space! Congratulations on your finish! Well done with your magic ruler and those lovely fabrics. You killed two birds with one stone. I'm doing both challenges too and I did see a finish next to your name on Anne Marie's blog. Hurry up Lenni! I love your 9-patch. Love it!! I so love reproductions fabric too! I think you did accomplish finishing two tasks with one quilt! Great job, Candace! I'm curious about the lighting too. I have the same problem. Love all of those little background prints. I have so many of them..Great job starting out the New Year. My lighting is track lighting the length of my 27' sewing room. Very easy to install and purchased at Lowes. I like these because I can adjust each seperate light to shine where I need it. I also use those clamp on lights one for the Bernina and one for my work table. I have a couple of individual portable lights and an Ott lite..Somehow it all works. I do have two windows in the room but with these very dark and gloomy days they do not help much.We didn't design the room it just came with the house.I think everyone has to figure out what works best for their room and work stations..When Lenni arrives it will be a whole new ballgame so you might want to wait and see what your needs will be..As time goes on I find I need more light! Vey nice finish. I'm working with repro fabrics on two projects right now and I just love them. Great choice on the light fixture, I need (want) a new one for my eating area, but I just finished my garden area. I gave my landscaper pics of your garden as inspiration, and I love what my guys did, now for spring to arrive! Love your new little quilt! I'm a lover of traditional fabrics, too. Dan put track lighting in my sewing room and I love that I can aim the lights where I want. It's in kind of an "I" shape. Love those Civil War fabrics. Pretty quilt! Lighting... I have recessed lights thru-out our house. They are great for general lighting, but I still need my Ott for sewing while sitting under them. My sewing room and my longarm room have flourescent ceiling fixtures. IMHO, you just can't beat those good ol' flourescents. Not the prettiest but my friends have light envy when they are in my rooms. Good luck in choosing! Great question about lighting. I'll be checking back to see what everyone has to say. I read that you should care more about "lumens" than "watts", and also that Blue Max Full Spectrum HD compact florescent bulbs are best for the kind of work we do. Haven't tried them yet, so I can't really give you a thumbs up or down. Oh...love your 9 patch! A finish already! WTG, Candace. When is Lenni expected to arrive? I hope it's soon because you're going to be busy. I've been trying to send you an email and 3 times it's bounced back. Just testing to see if you get this. What a great pattern! I know I have it around here some place. I've been thinking of making a Valentine's table topper, and that would be a wonderful choice of pattern. OOOO, I like that kit. I see alot of bloggers participating in the 9 patch. It is a great block to work with. Can't help you with lighting. I don't have good lighting in my space so I usually don't do much sewing at night. During the day it is pretty bright. I've been following your blog now for awhile and enjoy it tremendously. Especially enjoyed the Minam River Wedding. With regard to lighting: I had fluorescent lighting in my laundryroom and just recently replaced it with recessed lighting (handy hubby did it). What a huge difference! I am now going to do the same in my sewing room, as it needs brightening up. Thanks for a great blog. Oh my word, Candace, your Schnibbles turned out wonderful !! I am SO impressed with it - and I'm liking those colors.